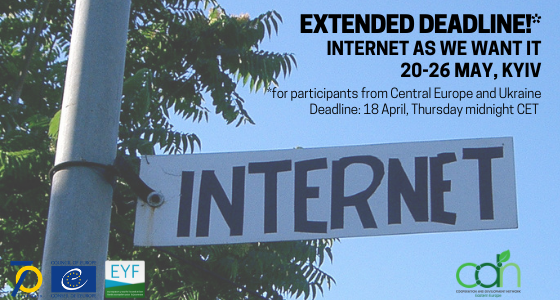 The following “Call for Participants: Internet As We Want It” is extended till 18 April, Thursday midnight CET for participants coming from Ukraine and Central Europe. (3) Equip young green activists from Eastern Europe with tools for fair, safe and equal participation in web-platforms by eliminating the risk of self-censorship and standing up for their (digital) rights. The programme will be based on the principles of non-formal education and intercultural learning. We strive for an active, inclusive environment for direct communication and sharing of knowledge. The sessions will be balanced between theoretical inputs, work in small groups, workshops, discussions, training and other interactive methods of non-formal learning. We are looking for 28 young people between 16-35, residing in one of the Council of Europe Member states, Belarus or Kosovo*. We encourage applications reflecting diversity in all forms; therefore we welcome applications from those who identify as women, LGBTQIA+, POC, or with a disability. Participants who have activism experience in open culture movement and internet governance and with relevant knowledge to the topic are highly encouraged to apply. Language: The main language of this activity will be English. But not being comfortable interacting in English should not prevent you from applying. Costs: The full cost of working materials, visa and lodging (accommodation in multi-bed rooms, vegetarian food, and refreshments) during the event will be covered by the organizers. In exchange, we ask for a participation fee of 20 EUR for participants coming from non-EU countries and 50 EUR for participants coming from EU countries, Norway, Switzerland, and Iceland. Applicants for whom paying this fee is an obstacle for participation, should still apply and mention this in their application. CDN will try to find a solution together with the applicant after the selection is finalized. CDN will reimburse 90% of the travel costs for the participants from the non-EU countries and 80% of travel costs for the participants coming from the EU countries, Iceland, Norway and Switzerland within reasonable limits and within Europe, with the condition to combine the most economic and environmentally friendly way (lowest price + travel time + CO2 emissions). You will be informed about the results of the selection within two weeks after the deadline. *All references to Kosovo, whether to the territory, institutions or population, in this text shall be understood in full compliance with the United Nations Security Council Resolutions 1244 and without prejudice to the status of Kosovo.